It all began with a cup of coffee – or rather the Arabic coffee cup. A couple of days ago we published a post on the latest edition of our signature branding and design newsletter Senso – you can read the full post here. 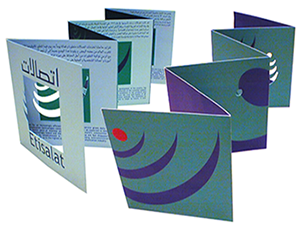 Followers of our work either here on our blog, our Facebook page or our website will know that our newsletter, much like our calendar, functions like a canvas for us to continually explore elements of design from the Arab world. Every issue of Senso is preceded by weeks, sometimes months of ideation and research within the team as we look for a central theme to determine the creative direction. Sometimes our inspiration comes from one of the client projects featured in that issue – for example the Issue 12 cover was a play on the camera lens as inspired by the Al Ain Photographia Award campaign we did for Al Ain City Municipality – previous post here. The artwork for this 13th issue puts the spotlight on the intricate patterns that usually adorn the cups used to serve coffee in many local café houses in this part the world. Much like their glass tea cups counterparts, these little ceramic cups can vary in colour & the detailing in the patterns around the rim edge of each set. So we evolved this further and created an Islamic pattern style which can be seen in the architecture of souqs & mosques. The injection of geometrical shapes, namely the triangle, became a graphic device for the layout of text and images for each article. Ofcourse, the bi-product of all this is that we have a selection of covers that never made the cut! We’ve shared a few of these via our Scribd profile. Subscribe to our newsletter via our website here to receive our next Senso or send an email to info@zaman.ae.